The Brogan family welcomes you to Ningaloo Coral Bay Backpackers, your year-round holiday oasis at the southern gateway to the world famous Ningaloo Reef. We were first attracted to Coral Bay 30 years ago by its unique marine environment, diverse flora and fauna, and idyllic, isolated location. Today, those same attractions draw visitors here from around the world. From its beginnings as a caravan and chalet park in 1978, Ningaloo Coral Bay has grown to become the premier holiday resort for anyone eager to experience this spectacular paradise. Within a close walk to the beach of Coral Bay, we provide Superior Backpacker Accommodation, choose from twin, double, ensuite or dormitory rooms. The facilities comprise of a outdoor swimming pool, alfresco dining, poolside bar, internet access, pool table, choice of air-con or non-air con rooms, table tennis, share kitchen and laundry facilities. In short, there is no friendlier, better located or more relaxed place to immerse yourself in the wonders of the world famous Ningaloo Reef. 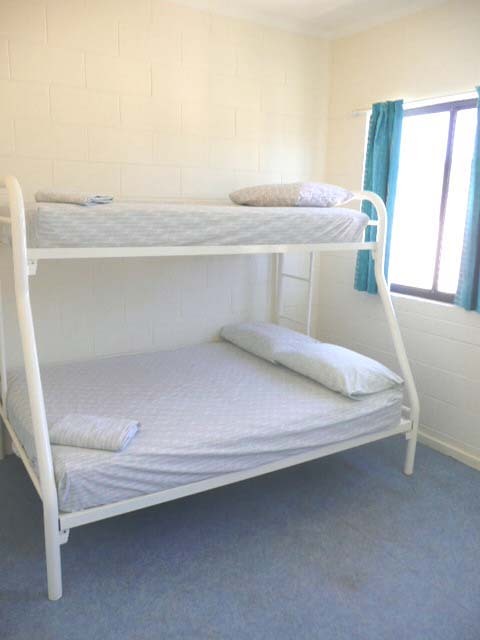 4 Bed Dormitory room with air conditioning - 2 sets of single bunks. Bed linen provided, towels and blankets available for hire. Please note that photo identification & a cash bond of $20.00 per key is payable on arrival. Rates valid to 31 March 2020. Subject to increase from 01 April 2020. 6 Bed Bedroom Dormitory - 3 sets of single bunk beds. Bed linen provided - blankets and towels available for hire. Please also note that photo identification & a cash bond of $20.00 per key is payable on arrival. Rates valid to 31st March 2020. Subject to increase from 01 April 2020. 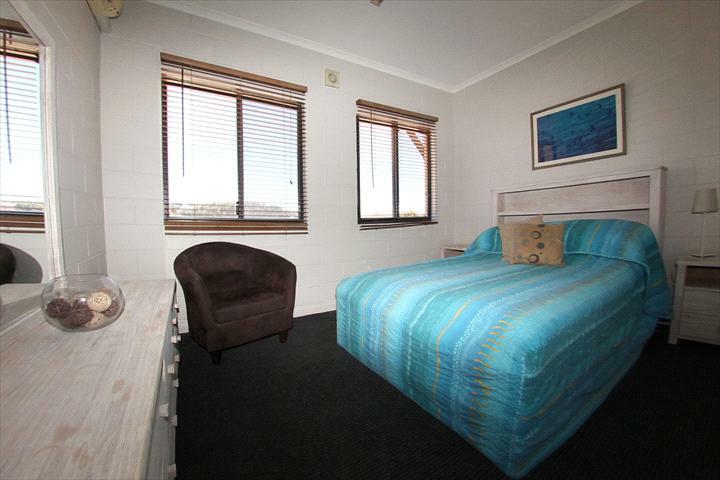 Double room with ensuite (shower & toilet) and air conditioning. The bedding configuration is 1 x Double bed. Bed linen and bathroom towels are provided. BYO beach towels. GUESTS MUST BE OVER 18 YEARS, HENCE NO CHILD RATE. Please also note that photo identification & a cash bond of $20.00 per key is payable on arrival. Minimum stay requirement of 4 nights over New Years. Rates valid to 31 March 2020. Subject to increase from 01 April 2020. Double Room. The bedding configuration is 1 x Double bed with a Single bunk bed above. Bed linen provided for all rooms - Towels (hire available). GUESTS MUST BE OVER 18 YEARS, HENCE NO CHILD RATE. Please also note that photo identification & a cash bond of $20.00 per key is payable on arrival. Minimum stay requirement of 4 nights over New Years. Rates valid to 31 March 2020. Subject to increase from 01 April 2020. 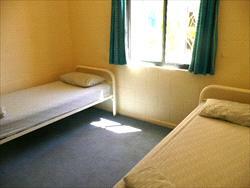 Twin room with air conditioning. Room has 2 single beds. If sole use required, both beds must be booked. Bed linen provided for all rooms - blankets and towels available for hire. GUESTS MUST BE OVER 18 YEARS, HENCE NO CHILD RATE. Please also note that photo identification & a cash bond of $20.00 per key is payable on arrival. Minimum stay requirement of 4 nights over New Years. Rates valid to 31 March 2017. Subject to increase from 01 April 2017. Photo identification & $20 key deposit is required upon check-in. 21 Days written notice of cancellation is required for 90% refund of deposit. No refunds are given for cancellation inside 21 days and Travel Insurance is recommended.